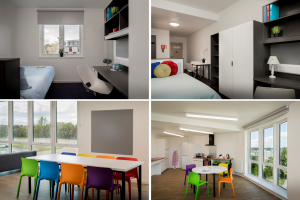 Known as The Copse, the new scheme comprises 643 new student bedrooms laid out in cluster apartments for between four and 12 students. The development continues Uliving’s partnership with the University and extends the Knowledge Gateway, a research and technology park at its Colchester Campus. It follows Uliving’s refurbishment of 780 student bedrooms as part of The Quays and the development of 648 new bedrooms as part of The Meadows, which completed in 2013. The Copse was funded through an innovative index-linked wrapped bond placement. Equity partners together with Uliving are Equitix and Centro Place Investment; the credit enhancer was Assured Guaranty; the bond purchaser was Pension Insurance Corporation; and the bond arranger was TradeRisks. Uliving is a company that has been founded with a simple mission: to be the creator of the most in-demand student accommodation, by providing the most relevant facilities at the most appropriate price. Ideally suited for delivering this ambition, Uliving’s foundations are strong, bringing together the wealth of expertise in its family of companies each with a track record of successfully delivering the key aspects of its mission. With successful ventures at the Universities of Essex, Hertfordshire and Gloucestershire – and more on the way – Uliving is a growing business, but one with a continued focus on the student experience. Uliving is not afraid to look at different ways of doing things when it comes to delivering for its clients, allowing them to focus their resources on academic strategies. More information is available at www.uliving.co.uk.